Whaaaaat? Kaaallllleeee? Yes, that cruciferous king of anti-oxidents, kale. In chip form. You know, like potato chips. Or banana chips. So here is the scoop. Last summer my husband and I spent a week camping up in the Northern California Redwoods. On the way up, we stayed in a little town along the 101 called Ukiah (it’s Haiku backwards…pretty Zen huh?). Ukiah is located in the Southern part of Mendocino County and while the area boasts some fantastic wineries, we were there for the beer. The organic beer at the Ukiah Brewing Company to be specific. http://www.ukiahbrewingco.com/. The beer was definitely tasty and we did our best to try it all. 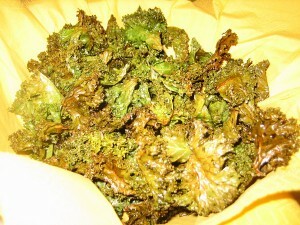 However, the kale chips were the true scene stealer. When we saw them listed on the specials board we were intrigued. And a little scared. 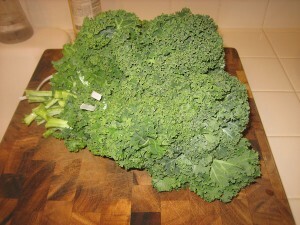 Did I mention how cruciferous kale is? So, we ordered some. Deep green and melt-in-you-mouth crispy, these little gems were salty, nutty and delicious. After all, this wasn’t some sort of raw-food patchouli -scented yoga practicing kale, man—this was kale you eat while drinking beer. 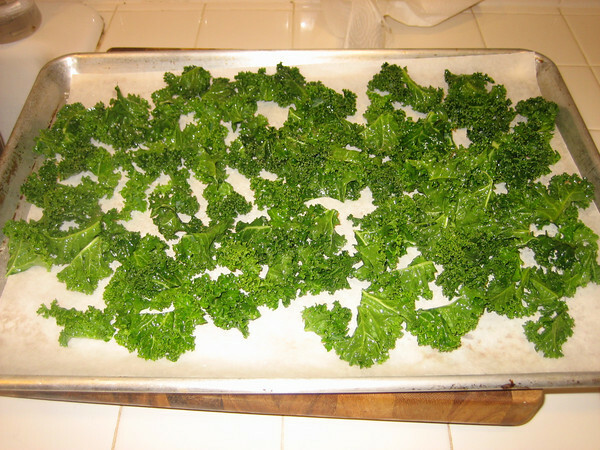 We assumed the chips at the Brewing Company were fried, however, a little research upon returning home from our adventure yielded several recipes for baked kale chips. So I started experimenting and to be honest, I’m pretty sure I’ve discovered Nirvana—at least where dark green vegetables are concerned. Seriously, they are that good. And super easy. Blink and you’ll miss the recipe. 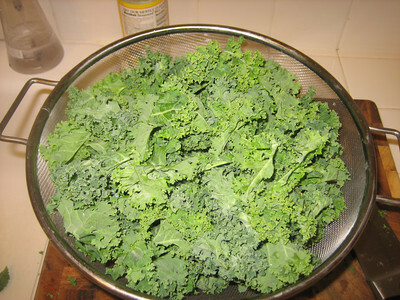 Start with a bunch of kale (or if you live in my house, two bunches, one for each greedy kale cruncher). 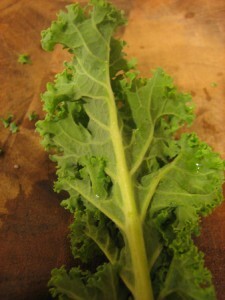 There are several types of kale. I’ve tried this recipe with curly green and red kale (the red is surprisingly sweet). I haven’t tried it with Tuscan kale–but assume it would be great. You want to remove the ribs. I find it easier to flip the leaves face-down and then just cut out the ribs. Once you have strips of just the tender leaves, tear them into bite-sized pieces, wash thoroughly and allow to dry completely. After the kale is dry, toss it into a large bowl (it’s hard to tell the scale of the bowl in this picture but, it’s a big one). 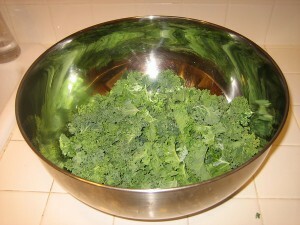 Now, for every bunch of kale, mix together a tablespoon of olive oil and a tablespoon of your favorite vinegar. I’ve tried several kinds and my favorite is white balsamic. But, use whatever toots your horn. I know you know what is coming next. Dump your vinaigrette into the kale and toss the salad (yes, I just said that) until you’ve got every piece coated. Then, salt and pepper to taste. Now the whole lot goes onto a sheet pan. Spread the leaves into a single layer. I like to line the pan with parchment–because, well, if you haven’t figured it out yet, I line everything with parchment. Into the oven for 15-20 minutes. Be sure to flip the chips halfway through. 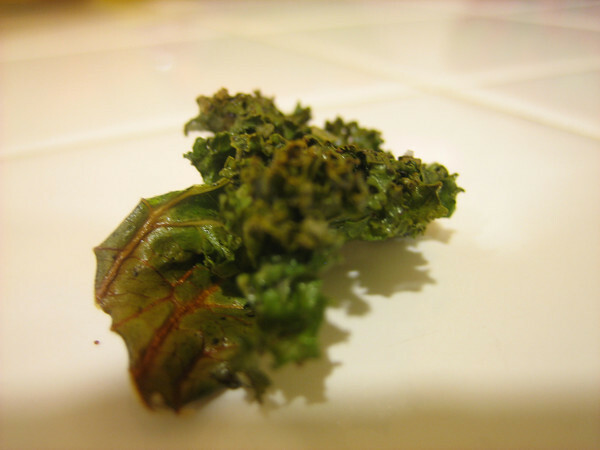 And now you’ve got kale chips. Use them to win friends and impress neighbors. Or just eat them yourself. I have no idea if these will keep stored over night as they’ve never lasted over night in our house. Cut-out ribs and tear kale leaves into bite-sized pieces. Wash and let dry thoroughly. 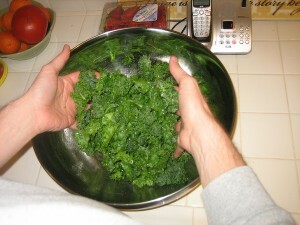 Mix together oil and vinegar and toss into kale coating every piece. 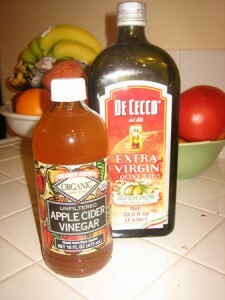 Spread into a single layer on a parchment-lined baking sheet. Bake for 15-20 minutes until crispy, flipping chips halfway through baking process.